As a perfumer, Daltroff was a true innovator combining new and exciting synthetics in a very bold way with traditional ingredients. While all Caron scents are stunningly diverse, even though created by a single perfumer, each share a common thread in their base accord called "Mousse de Saxe" which is a blend of geranium, liquorice, leather, iodine and vanillin. Of his creations, many are still in production including Narcisse Noir , Infini , N'aimez que Moi , Tabac Blond , Nuit de Noel , Bellogia , Fleurs de Rocaille , Royal Bain  and many others created during the Wanpouille years by the subsequent Caron perfumer, Michel Morsetti. All can be sampled at Woodforde's. Daltroff's legacy is apparent, not only through the Caron scents that have endured for nearly a century, but in his influence upon successive perfume houses. 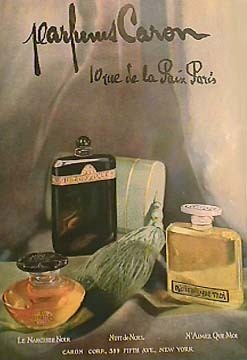 Madame Rochas, Caleche, Chanel No 19, Bois de Iles and Habanita were all said to be based in greater part upon Daltroff's original "Mousse de Saxe" accord. There are 8 products in the range for you to explore: you are viewing page 1 of 2. Parfum Sacre is an perfectly balanced oriental. Top notes of rose and lemon blend harmoniously with a spicey heart created from mace and cardamon and pepper, underpinned by a smooth balsamic myrrh, warm amber and smokey vanilla. Created in 1981 by the perfumer Gerard Lefort, Nocturnes is said to be a modern reinterpretation of the 1922 Caron classic Nuit de Noel. Uniquely, it manages to combine both cleaness and elegance. Caron's celebrated Crystal Fountains, invented for Caron by Baccarat, are still used in Caron flagship stores throughout the world. They offer customers the enjoyment of filling their own bottles with the mysterious formulae behind some of the most precious Caron fragrances direct from the fountain, according to personal whim. Although Woodfordes have two Caron fountains on perpetual display, in order to preserve temperature stability and prevent oxidation, they are kept as reminders of the great Caron heritage only, and are not used for decanting.